TRUGS phonic reading games can be used to improve reading and vocabulary skills. The structured decodable TRUGS card games combines the professional phonics side of learning to decode print with the fun side of playing card games. Trugs is a structured phonics reading resource to support students who are learning to read. The game has been designed for the teaching of discrete, daily sessions progressing from simple to more complex phonic knowledge and skills. There are four different styles of card games at each of the structured and progressive phonic reading stages. 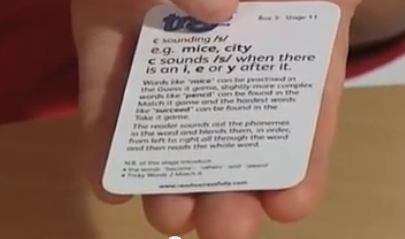 There is also an explanation about the teaching of the specific phonic sounds within the Instruction Booklet as well as a clue card containing a shortened explanation for the student to have alongside them to help recall. Assessment booklets for monitoring students’ progress are also supplied. Two Behaviour Support Classroom teachers have used Trugs (alongside other literacy and behavioural interventions) with small groups of students in both Junior and Senior Cycles. One of the teachers also used Trugs with a 1st year class group as part of a Reading for Pleasure intervention. Based on pre and post reading assessments conducted by the teachers in the Behaviour SupportClassroom with six students, the following table presents the chronological and pre and post reading ages of those students who received a variety of literacy interventions, including Trugs, over the course of the academic year. During an interview, the two teacher researchers described the benefits of Trugs in supporting other literacy interventions and building not only the literacy skills of their students but their social and emotional skills as well. "… I think it is the competition. Anything with competition especially for the chaps is great…The amount of reading in 10 or 15 minutes of playing Truggs. There is never an issue about playing it. You know the little assessment at the start to see what level to play at wll usually we wouldn’t do that on the same day that they were going to play the game. So you leave it as the game is the game for the sake of the game. Really good. Three out of the four games they really love, they would play them all day." “Can we play? Can we play?” As a treat on a Friday." "They want me to give them sentences that are a little more challenging. But they still like it. But that fourth game, they have to keep score so they have to use a pen and a paper. That puts them off." NBSS: And did you see it as a tool that improved their reading and word recognition? "Undoubtedly. Undoubtedly. Really, really did." "You would be surprised. I couldn’t believe how quick they were at making up sentences. Because I was sitting playing it with them one day and I …well, you know you get competitive with them. And I was like I have to get the sentence first. But I was surprised at how good they were at coming up with sentences." "They are reading the words. Seeing it and being able to say it that came on an awful lot. And then just their recognition of those simple, every day words – that really improved by using it." "Because they are looking at it and reading it and then they have to think quick… And then for two students it was a great bonding thing because they don’t see eye to eye. They are not the best of buddies. So they are sitting here playing Trugs together." "These are two students who cannot walk down the same corridor." "But they are in here together…they will sit together and play Trugs."